We were recently doing a comprehensive marketing assessment with a new client: a smaller, niche, graduate college with limited budget and resources. Over the past few years, they have experienced flat enrollments and wanted to know what else they could do to get more leads and applications. We spent hours mapping out all their current marketing activities: digital campaigns, social media, event sponsorships, inbound, open houses. They had a lot going on! At one point during our assessment the marketing director said that he wakes up in cold sweats worrying about minute details of their expansive marketing strategy. It was clear that he and his team were spreading themselves thin, which is no way to live. I desperately wanted to help these people out. Comprehensive assessments allow our strategy team to sit down with a college's marketing and enrollment staff over a 1-2 day period and ask questions to identify what's working, what isn't, and where additional opportunity exists. We then provide strategic marketing goals, channel-by-channel action plans, and key performance indicators (KPI). As soon as we left campus, we got to work. After reviewing the client’s upcoming enrollment goals, historic sources of leads/apps/students, and their website, we found the problem. The problem isn’t the people (by the way, people rarely are the problem). The enrollment and marketing teams we met with are bright, hardworking, eager, and full of ideas. The problem isn’t that they are doing too little. They are doing a lot with a small budget and team. The real problem is that they are doing too much. More specifically, they aren’t focusing on the main strategies that have the highest marketing return on investment (ROI). After analyzing historic enrollment data, we found that over 95% of students came through their website. The website analytics said a similar story. 95% of traffic came from organic, which didn’t seem to align with the fact that most of their budget was going towards generating paid traffic. While they had invested in SEO in the past, they didn’t see it as a sustainable lead generation strategy, and thus didn’t see the important role it plays in boosting ongoing enrollments. In addition to the lack of ongoing SEO, the website was violating some basic rules of conversion rate optimization (CRO): missing forms, challenging UX, weak or non-existent calls to action, and thin, outdated, unoptimized content. We were able to map out a solution for this client that will increase their enrollments and even save some marketing budget. And perhaps most important, simplify their marketing activity so they don’t lose any more sleep. 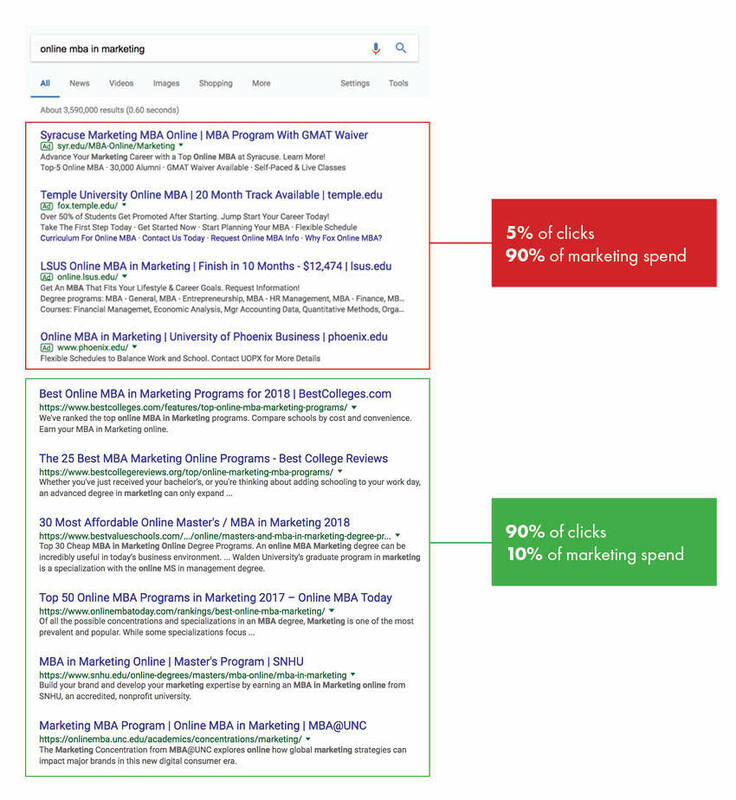 Rand Fishkin, co-founder of Moz, recently presented Google data that shows 90% of website clicks are on organic search results, and only 5% on paid search results. His point was that while the majority of a company’s site traffic comes from organic search, the majority of their marketing budget typically goes to paid digital marketing. The biggest source of students, at every graduate and online school I’ve worked with, is the website. Yet most schools aren’t making SEO and conversion rate optimization their top priorities. Like our friends in the example above, most higher ed enrollment professionals are working too hard, and not seeing the results they need. When marketing for higher education institutions, your website is your best and biggest tool. If you’re going to invest in anything over the coming year, invest in your website. Make sure that it is converting as high as possible. Then, have an SEO professional (in-house or outsourced) drive more quality organic traffic to the site. While your site is being optimized, spend your time analyzing analytics, conversion rates, and lead sources. Cut out all of the marketing scrambling. Remind yourself that it’s ok to say no to some new ideas. Every new marketing tactic that you undertake steals time, resources, and focus away from other tactics. Stay attentive to the strategies that produce the highest ROI. Complete the form below to learn about our strategic comprehensive assessments.